I don’t care what people are calling kale. It’s become one of my favorite vegetables for another reason. Not only is kale packed with vitamins and minerals whose health benefits are indisputable, it is very versatile. If you have any doubts, just ponder this: Kale chips are a great on-the-go snack that are easy to make. The addition of kale to an iceberg salad makes it a nutrition dynamo. And in the case of soup, it goes great with most other vegetables and any number of meats, including chicken and sausage. And that brings me to today’s recipe, Chicken, Kale and Bean Soup. 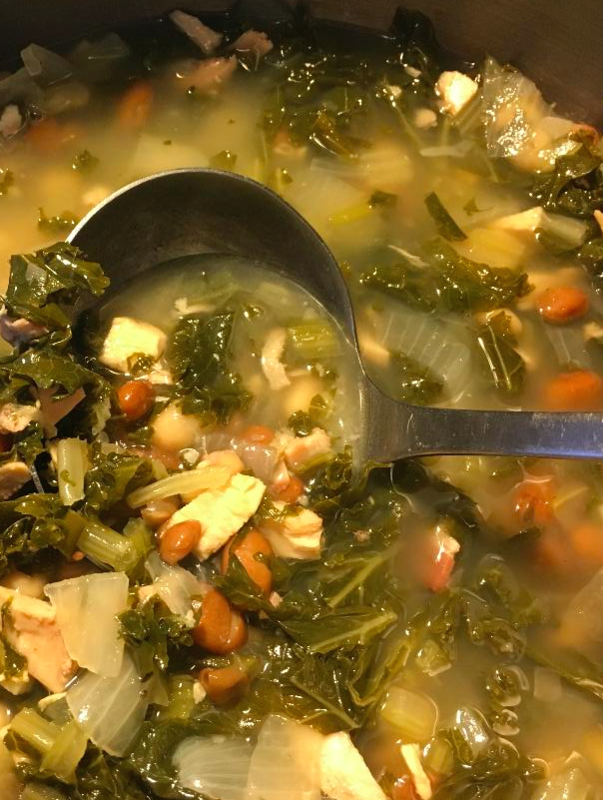 With two kale plants in our garden that are big producers and a pile of leftover chicken, soup seemed like a logical choice. That’s what I call a no-brainer! Heat the olive oil in a large soup pot or Dutch oven over medium high heat. Add garlic, celery, onion, salt and pepper. Cook, stirring frequently until tender, about 5 minutes. Add the beans, chicken broth, water, kale, chicken and thyme. Stir well to combine. Cover and bring to a boil. Reduce heat and simmer until kale is tender, about 5 minutes. Serve topped with shredded Parmesan cheese, if desired. Yield: Serve 4 to 6. I’m going to try this, Jeff. We might as well put quality fuel in our bodies. One point of clarification: I thought vodka was the must-have snowstorm essential in North Dakota. Oh, well.